Curator Katherine Anne Paul presents a lecture that introduces the stunning aesthetics of Buddhist art. Paul also translates important visual vocabularies employed to communicate Buddhism. The talk culminates in a virtual walk-through of a mandala (circular representations of the universe). 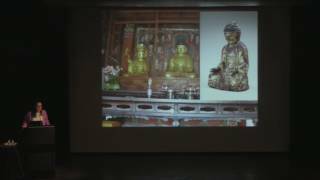 This lecture was presented at the Frist Art Museum on February 10, 2017 in conjunction with the exhibition Secrets of Buddhist Art: Tibet, Japan, and Korea, on view at the Frist from February 10 through May 7, 2017.